﻿ Karaoke Hire Edinburgh - Rent a Karaoke system. We are a Karaoke Hire company located in the centre of Edinburgh, within a friendly retail environment and helpful staff to help you decide on your perfect Karaoke setup. We have been in the business over 30 years, with that kind of knowledge you know you cant go wrong!. Unlike other hire companys, Here at Karaoke Hire Edinburgh, We have no hidden hire costs, we don't charge you for the leads to go with your Karaoke equipment hire everthing is included. Let's face it you don't hire a car and have to pay extra for the steering wheel!! Karaoke Hire Edinburgh are proud to offer the perfect Karaoke Hire for people who want to hire a complete plug and play Karaoke system, Extremely easy to set up, takes 5mins. Karaoke Hire Edinburgh are proud to offer the perfect Karaoke Hire for people who want to hire a complete plug and play Karaoke system and wants a powerful sound system, Extremely easy to set up, takes 5mins. This hire system has an upgraded sound system. Karaoke Hire Edinburgh are proud to offer a range of Deluxe Karaoke systems. This hire system is great for those special events! With this hire package we take away all the stress as we will Deliver it, set it up and collect it, meaning all you have to worry about is singing your favorite songs all night. Using the latest Professional Monitor stands from Audipack this set up is just as fashionable as it is functional. Our Professional Sony 40" HD LCD comes with a specially designed anti glare screen suitable for outdoor use! (not to be compared with domestic units found in retail stores with shiney screens). You can even plug in your PS3/Wii/xBox to have a multi function Karaoke!!! 4ft Flame Machines look great on either side of the singer!. Popstar effect!! Auto Spotboxes Add a Party atmosphere to your Karaoke! Sound active!! Singers look like they are on the xFactor!!! When you hire a Karaoke from us, we would like to offer you the great hire deals above. You can choose one or all three, it's your Karaoke hire!! Wireless microphones, allow your singers to get into character without worrying about microphone cables. With this dual system 2 seperate singers can sing without tangled up in mic leads!! Great for that authentic xFactor Karaoke feel. 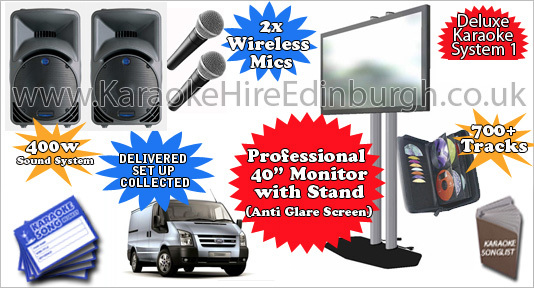 Want to hire a Karaoke in edinburgh but need it delivered set up and collected? Karaoke Hires in Edinburgh Just got easier !!! All of our Hire equipment is checked Daily, and before the Hire. Unlike many Karaoke's in Edinburgh we Update and Service our Hire items on a Regular basis to ensure you get the best selection possible. We Hire High quality brands like, Mackie, Peavey, JBL, Sure, Technics, Pioneer, Soundcraft, EVL and Martin... To name a few. Why risk your special night hiring from some cowboy with cheap sound equipment when you can hire the same equipment as the Pro's use at prices to suit any hire budget here at Karaoke Hire Edinburgh! Our Equipment is PAT Tested, where applicable. Karaoke Hire Edinburgh just made it even easier, we have put together a selection of Karaoke system hire packages, including everything you need! Have your hire delivered and set up in Edinburgh from £30 (for delivery & setup outside Edinburgh please contact us for pricing)! All our hire equipment is professional, but is easy to use. If its your first time please ask as many questions as you want, we are here to help. We will show you how to set up your hire system when you come to collect it. Karaoke Hire Edinburgh Can offer you any Karaoke Hire package to suit your party or event. Why not add some lights to your Karaoke to make it even more spectacular!! Bellow is a selection of thhe pre-made disco packages we offer for hire. We can also offer custom systems for those very special events. 13.12.08 Provided P.A system hire for MacDonald Brothers xFactor final Screening at the Vue Cinema's inEdinburgh.